Lord Jesus Christ who hast vouchsafed to glorify by numberless miracles the Blessed Virgin Mary Immaculate from the first moment of her Conception, grant that all who devoutly implore her protection on earth may eternally enjoy Thy presence in heaven who, with the Father and Holy Ghost livest and reignest, God, for ever and ever. Amen. 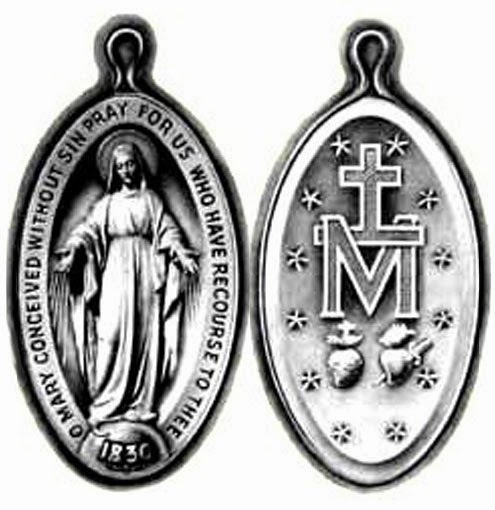 O Lord Jesus Christ who for the accomplishment of Thy greatest works hast chosen the weak things of the world that no flesh may glory in Thy sight and who for a better and more widely diffused belief in the Immaculate Conception of Thy Mother hast wished that the Miraculous Medal be manifested to Saint Catherine Laboure grant, we beseech Thee that filled with like humility we may glorify this mystery by word and work. Amen.